At Mayo Clinic, staff is encouraged to use social media, and training and resources are available to help us use it safely and effectively with confidence. But how do researchers and physicians (or anyone) become leaders on social media when there are millions of people on each platform?! Raising your profile on social media takes time and strategy. To elevate your personal brand, it’s important to devote a few minutes each week to building your account. I’ll focus on Twitter in this blog post. 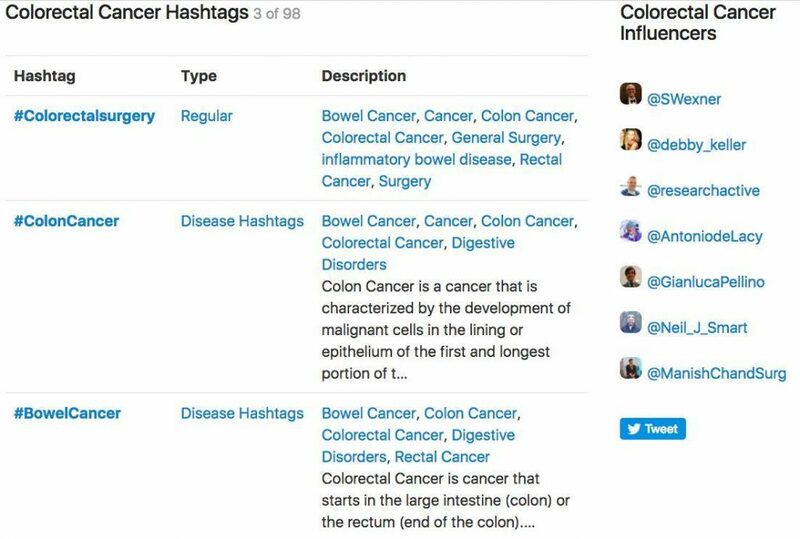 In the image below, you see the top three hashtags for Colorectal Cancer. You also see a list of colorectal cancer influencers, which brings me to my next tip. Researchers studying colorectal cancer should follow the users in Symplur’s list. You should also follow your colleagues in your area of expertise. For example, Michael Wallace, M.D., is a gastroenterologist at Mayo Clinic in Florida. Follow him, and then take look at his “following” list, to find others you should follow. 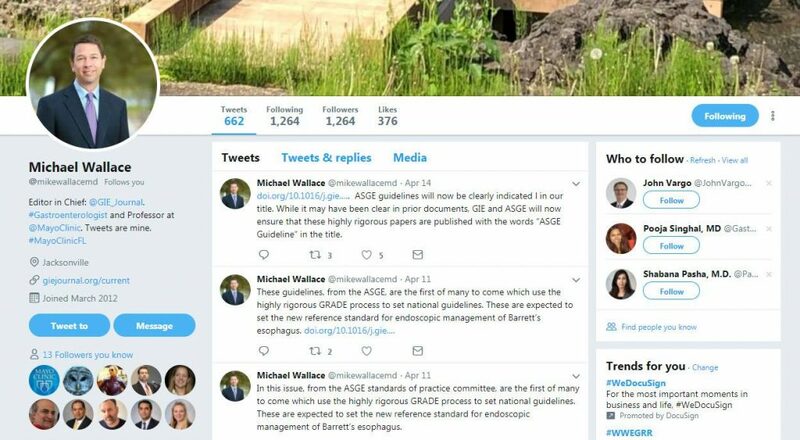 The images below show @mikewallacemd’s profile. He is following 1,264 users. You could peruse those users to identify others to follow on your own account, such as Gastroenterology, the flagship journal of the @AmerGastroAssn. Repeat the process by going to the Twitter profiles of other top influencers, and follow them as well. Some of those will be from journals in your specialty. Soon you’ll find you have a great source of the latest medical and scientific news that’s relevant to you. If you aren’t sure what to share, start by retweeting @MayoClinic, your colleagues, and relevant journals. As you become more comfortable tweeting, and sharing more content more often, you will effectively build your personal brand as an expert in your field. By doing so, you will subsequently help elevate the Mayo Clinic brand as a trusted resource for medical information.